The new Rex vacuum filling machines, series 300, 400, 700 and 900 are the result of more than 30 years of experience. They satisfy a broad spectrum of individual requirements. The new series replaces the already well proved and tested Rex vacuum filler programme and it is the innovative pioneer for machine processing of various types of liquid or viscous substances. Series 400 is flexible and universal: this is as suitable for the smaller or medium-sized meat-processing operations as it is for larger, highly specialised companies. Its smooth surface, hygienically designed, space-saving machine housing, is self-supporting and made entirely of stainless steel. The reinforced model of the large cell-feed system guarantees exact portioning accuracy for a maximum service life. No crushing or smearing: it ensures that all fillers are transported gently, especially for larger sausage meat charges, larger pieces of meat or raw sausage applications. The vane cell feed system is available with eight, 12 or 14 vanes, alternatively also with blind vanes. Thanks to the newly developed lifting device, the hopper of the RVF 400 – available in different sizes – can be filled simply and without any mess. 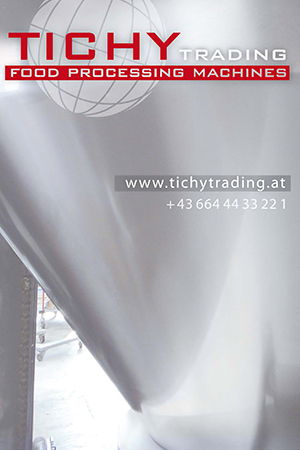 The in-feed systems guarantee exact portioning – for both of very cold or very tough fillers. At the same time all fillers are gently transported – i.e. without any squashing, squeezing or tearing. The RVF 736 and 761 may at any time be equipped with a drive unit for the grinder thanks to the large machine stand. The main drive unit in its reinforced design can achieve a filling pressure of up to 70 bar. In conjunction with the REX grinder and the minced meat line, it also offers maximum performance with exceptionally exact portioning at the same time. Thanks to the newly developed lifting device, the hopper of the RVF 700 can be filled simply and without any mess. The hopper is available in different sizes (250 and/or 350 litres).